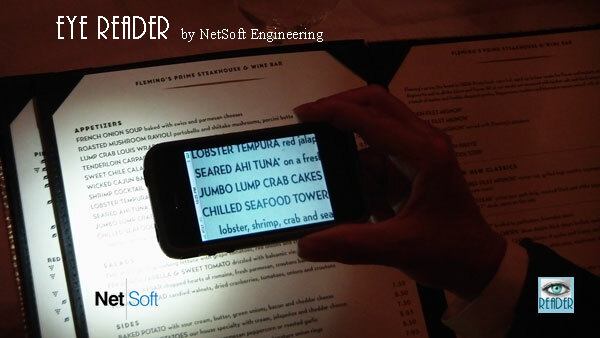 EyeReader is a unique reading magnifier that utilizes the LED light of the the iPhone, providing a solution to the problem of reading small print in dark areas --- like reading menus in restaurants. The LED light provides a bright light source which makes reading in low lit areas easy. EyeReader has a zoom capability by placing two fingers on the screen and then separating them to magnify the text the desired amount. Zoom in further by repeating the zoom. The EyeReader application is not only great for reading menus, but for prescription labels, restaurant checks, credit card vouchers, PlayBills, and is a handy tool for seniors. EyeReader provides a help button and screen which works in all screen orientations. Turn the LED light Off or On by gently shaking phone once. To Dim or Brighten the LED light, swipe one finger left or right on screen. To take a picture of screen, tap the screen twice to get a Save Picture button on the screen. Pressing the Save Picture button takes a picture of the current screen and saves the picture to the iPhone for viewing under Photos and Camera. This feature is great for such applications as taking a picture of a serial number in a hard to see location. Tapping the screen twice again takes the button off the screen. Keep your eye out for more from the "Silver Apps" series. Note: EyeReader requires iPhone 4 or higher.